Hillary Clinton's new book What Happened, a recap of the 2016 presidential campaign, is out this week. Naturally a whine filled, woa is me promotional tour from the failed candidate is well underway. Matt has been documenting the ongoing situation. 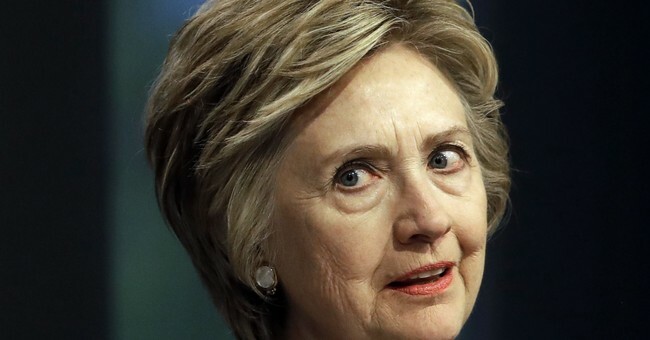 During an interview with USA Today's Susan Page, Clinton insisted the Russians fully colluded with the Trump campaign to beat her and laughably argued she believes in the "rule of law" and "evidence." "I happen to believe in the rule of law and believe in evidence, so I'm not going to go off and make all kinds of outrageous claims. But if you look at what we've learned since (the election), it's pretty troubling," Clinton said. Oh boy, where do we start with this? The woman who deliberately and illegally set up a personal, unsecured email server in her home to host, store and transmit top secret classified information believes in the rule of law? The woman who used BleachBit, not a cloth, to wipe her servers of evidence and 40,000 emails believes in...evidence? The woman who was given a free pass by FBI Director James Comey, who decided he would exonerate Clinton of any prosecution referral months before agents were done with their criminal investigation into her mishandling of classified information, believes in the rule of law? The only proper response to Clinton's pious claim is laughter, preferably out loud. During the 2016 campaign, the number one word voters associated Clinton with was "liar." This is just another example that they were accurate in their description.